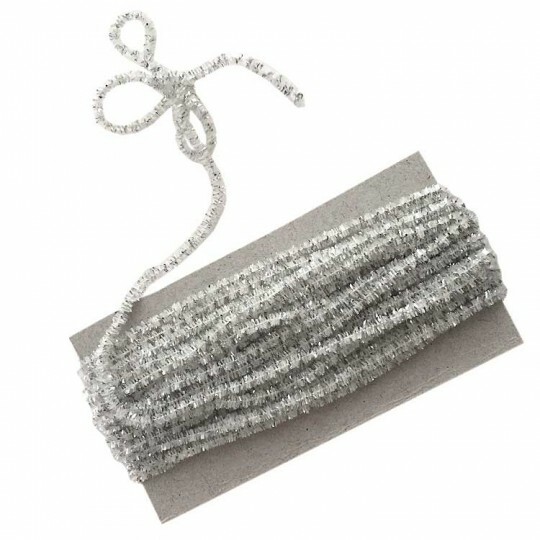 Supple, elegant and made in the USA especially for us, this chenille cording is a lovely addition to craft projects and makes a beautiful gift tie for those extra special presents. Offered in a rainbow of saturated and subtle colors, plus a range of neutrals and darks, you're sure to find just the right hue to compliment your next project. 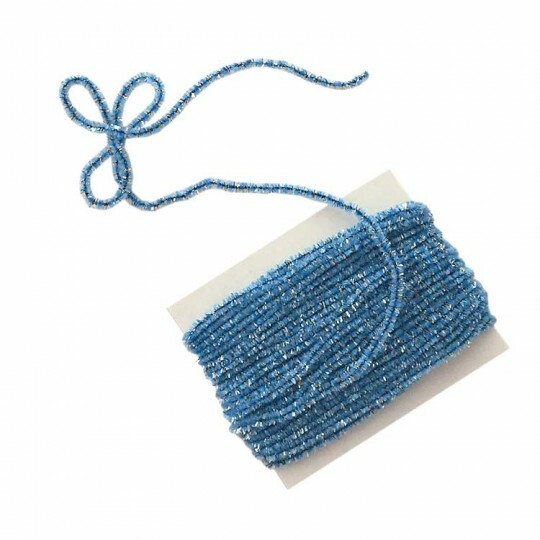 Cording measures about 3/16" wide and arrives wound onto cards in 5 yards lengths. 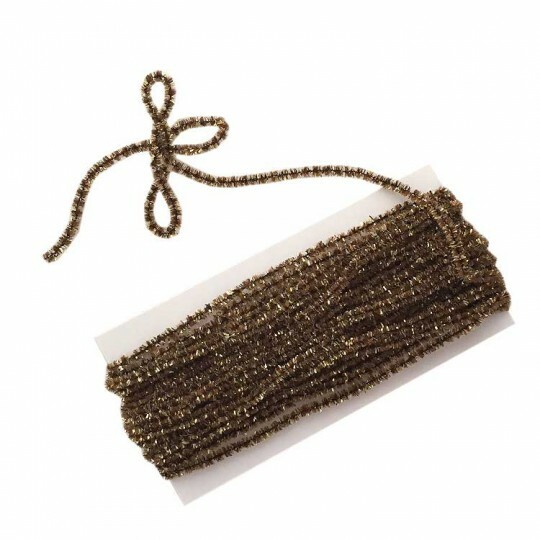 1 yard of antique gold lametta and tinsel cording is soft and easily bendable for use in creating antique style Christmas ornaments. This trim measures about 1/2" to 3/4" wide overall. 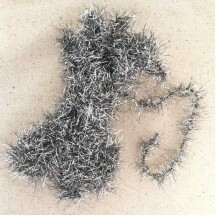 Made from tinsel in Germany. Will not tarnish. Old stock from the Christmas ornament trade in Germany. 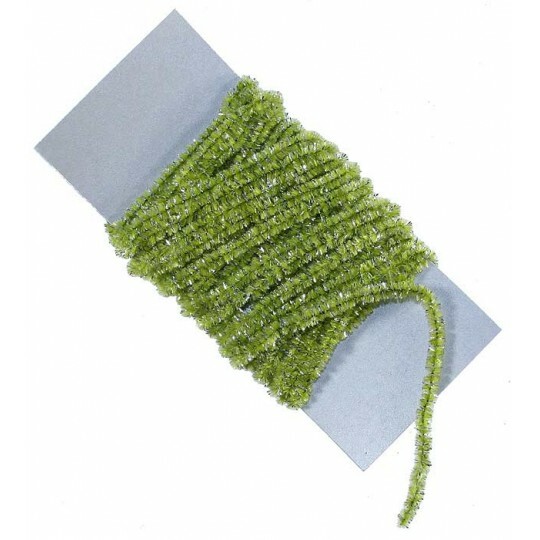 1 yard of silver lametta and tinsel cording is soft and easily bendable for use in creating antique style Christmas ornaments. This trim measures about 3/4" wide overall. Made from tinsel in Germany. Will not tarnish. Old stock from the Christmas ornament trade in Germany. 5 yards of burgundy chenille and tinsel cording wound on a card. This soft and supple cording measures a tiny 1/8" wide overall. Made from rayon and tinsel. Made especially for us in the USA. 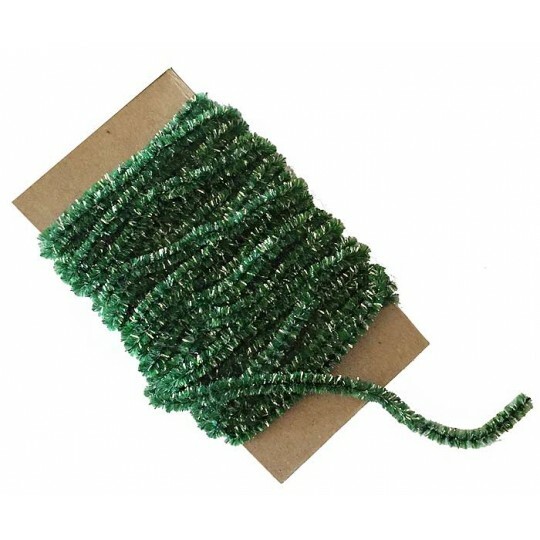 5 yards of celery green chenille and tinsel cording wound on a card. This soft and supple cording measures a tiny 1/8" wide overall. Made from rayon and tinsel. Made especially for us in the USA. 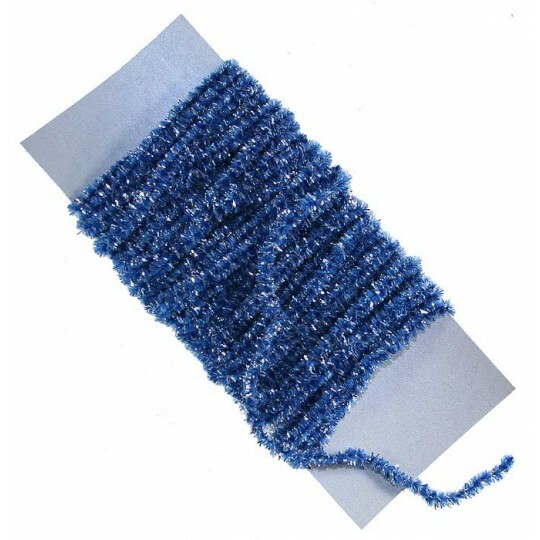 5 yards of cornflower blue chenille and tinsel cording wound on a card. This soft and supple cording measures a tiny 1/8" wide overall. Made from rayon and tinsel. Made especially for us in the USA. 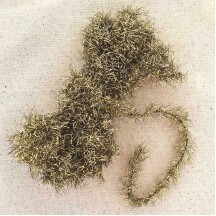 5 yards of ivory chenille and tinsel cording wound on a card. This soft and supple cording measures a tiny 1/8" wide overall. Made from rayon and tinsel. Made especially for us in the USA. 5 yards of old gold chenille and gold tinsel cording wound on a card. 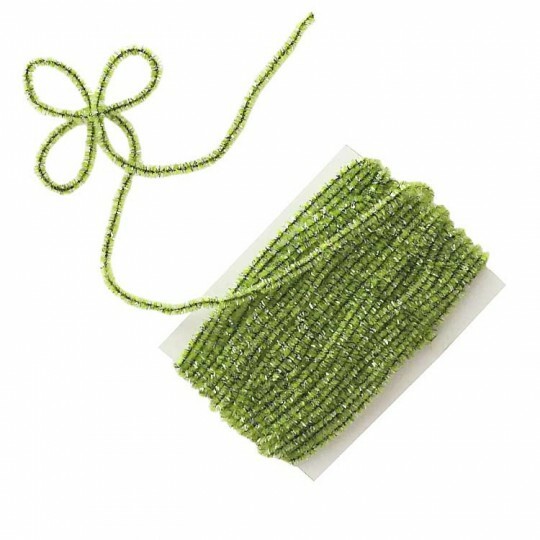 This soft and supple cording measures a tiny 1/8" wide overall. Made from rayon and tinsel. Made especially for us in the USA. 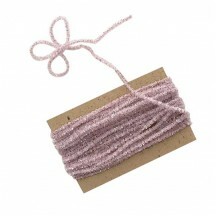 5 yards of pale pink chenille and tinsel cording wound on a card. This soft and supple cording measures a tiny 1/8" wide overall. Made from rayon and tinsel. Made especially for us in the USA. 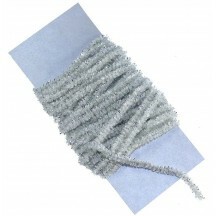 5 yards of silver chenille and tinsel cording wound on a card. This soft and supple cording measures a tiny 1/8" wide overall. Made from rayon and tinsel. Made especially for us in the USA. 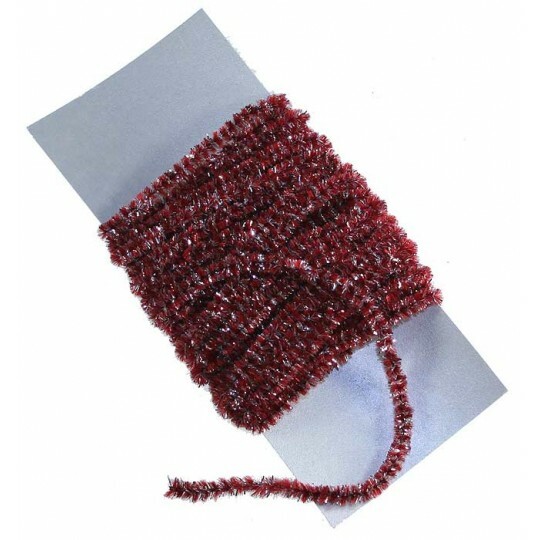 5 yards of burgundy chenille and tinsel cording wound on a card. 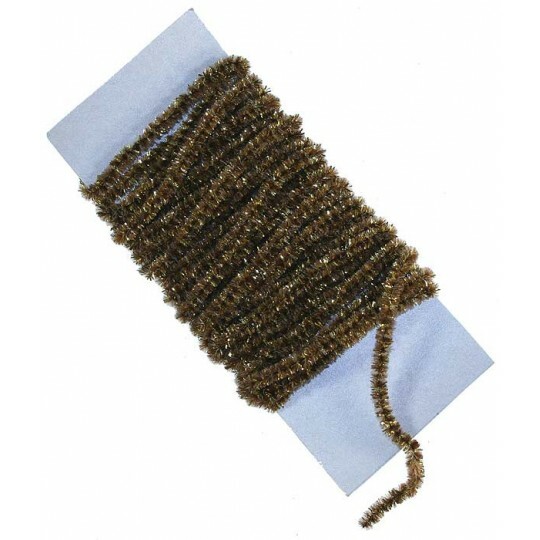 This soft and supple cording measures 3/16" wide overall. Made from rayon and tinsel. Made especially for us in the USA. Priced at $4.95 per 5 yards. 5 yards of celery green chenille and tinsel cording wound on a card. This soft and supple cording measures 3/16" wide overall. Made from rayon and tinsel. Made especially for us in the USA. Priced at $4.95 per 5 yards. 5 yards of cornflower blue chenille and tinsel cording wound on a card. This soft and supple cording measures 3/16" wide overall. Made from rayon and tinsel. Made especially for us in the USA. Priced at $4.95 per 5 yards. 5 yards of ivory chenille and tinsel cording wound on a card. This soft and supple cording measures 3/16" wide overall. Made from ivory rayon and silver tinsel. Made especially for us in the USA. Priced at $4.95 per 5 yards. 5 yards of lavender chenille and tinsel cording wound on a card. 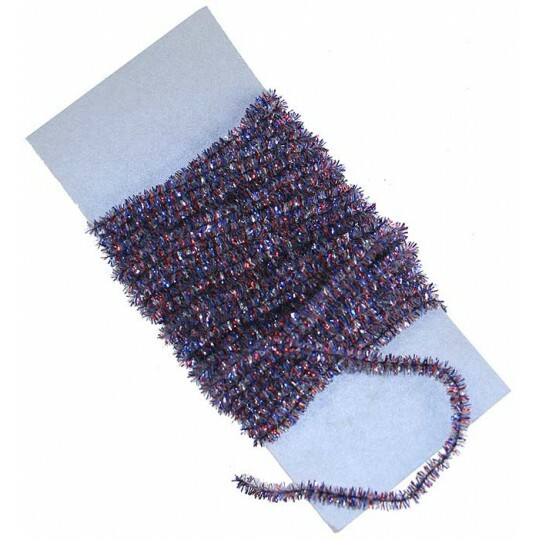 This soft and supple cording measures 3/16" wide overall. Made from rayon and tinsel. Made especially for us in the USA. Priced at $4.95 per 5 yards. 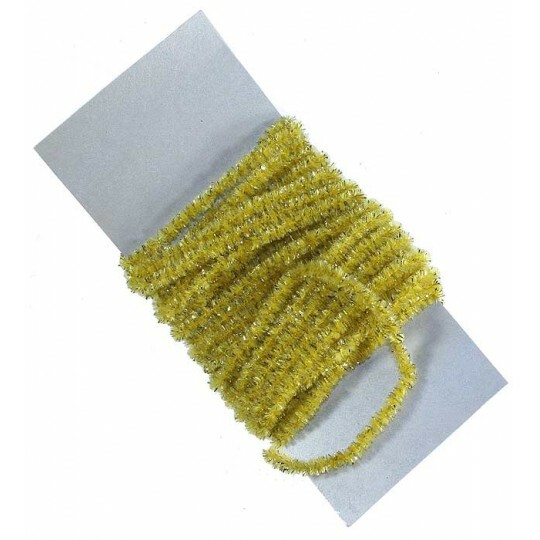 5 yards of maize yellow chenille and tinsel cording wound on a card. This soft and supple cording measures 3/16" wide overall. Made from maize rayon and gold tinsel. Made especially for us in the USA. Priced at $4.95 per 5 yards. 5 yards of old gold chenille and tinsel cording wound on a card. This soft and supple cording measures 3/16" wide overall. Made from old gold rayon and gold tinsel. Made especially for us in the USA. Priced at $4.95 per 5 yards. 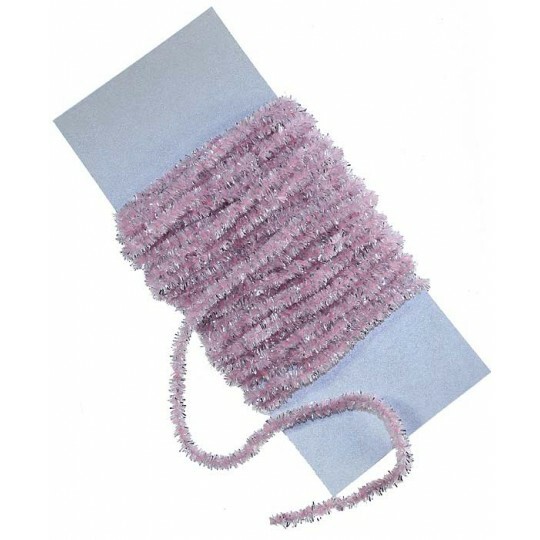 5 yards of pale pink chenille and tinsel cording wound on a card. This soft and supple cording measures 3/16" wide overall. Made from rayon and tinsel. Made especially for us in the USA. Priced at $4.95 per 5 yards. 5 yards of raspberry pink chenille and tinsel cording wound on a card. This soft and supple cording measures 3/16" wide overall. Made from rayon and tinsel. Made especially for us in the USA. Priced at $4.95 per 5 yards. 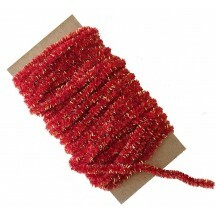 5 yards of red chenille and gold tinsel cording wound on a card. This soft and supple cording measures 3/16" wide overall. Made from rayon and tinsel. Made especially for us in the USA. This mix of red and gold has a slightly orange-red tone. Priced at $4.95 per 5 yards. 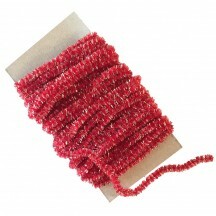 5 yards of red chenille and silver tinsel cording wound on a card. This soft and supple cording measures 3/16" wide overall. Made from rayon and tinsel. Made especially for us in the USA. Priced at $4.95 per 5 yards. 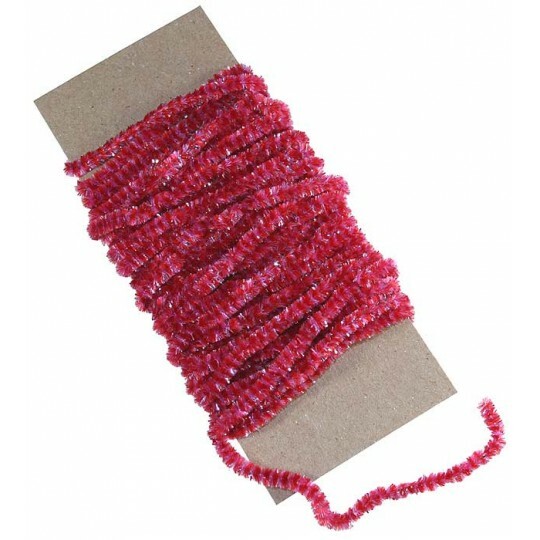 5 yards of red and pink stripe chenille and tinsel cording wound on a card. This soft and supple cording measures 3/16" wide overall. Made from pale pink and red rayon and silver tinsel. Made especially for us in the USA. Priced at $4.95 per 5 yards. 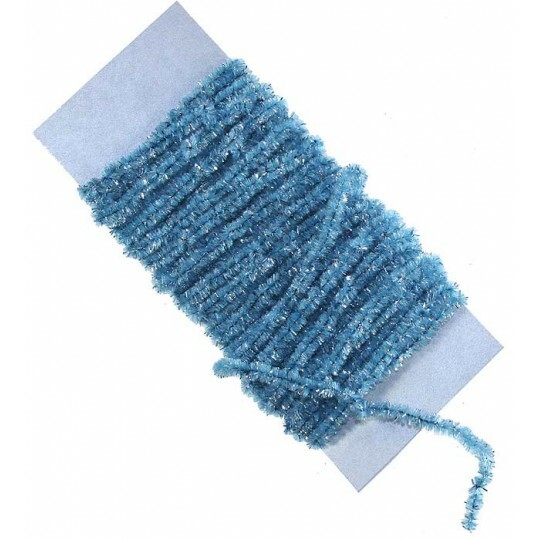 5 yards of ocean blue chenille and tinsel cording wound on a card. This soft and supple cording measures 3/16" wide overall. Made from rayon and tinsel. Made especially for us in the USA. Priced at $4.95 per 5 yards. 5 yards of red, silver and blue tinsel cording wound on a card. This soft and supple cording measures 3/16" wide overall. Made from tinsel. Made especially for us in the USA. Priced at $4.95 per 5 yards. 5 yards of silver chenille and tinsel cording wound on a card. This soft and supple cording measures 3/16" wide overall. 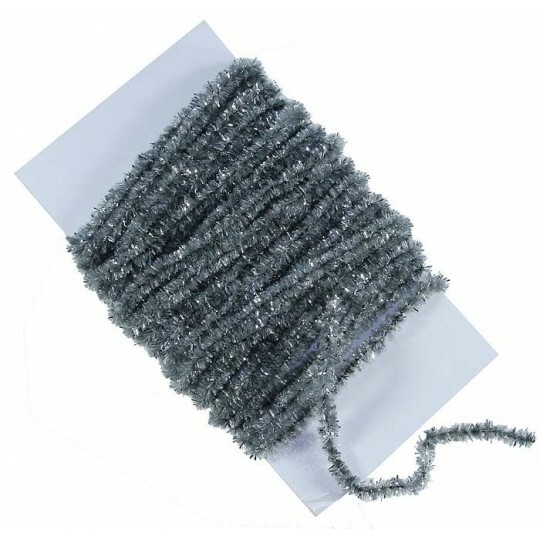 Made from silver rayon and silver tinsel. Made especially for us in the USA. Priced at $4.95 per 5 yards. 5 yards of green chenille and tinsel cording wound on a card. This soft and supple cording measures 3/16" wide overall. Made from rayon and tinsel. Made especially for us in the USA. Priced at $4.95 per 5 yards. 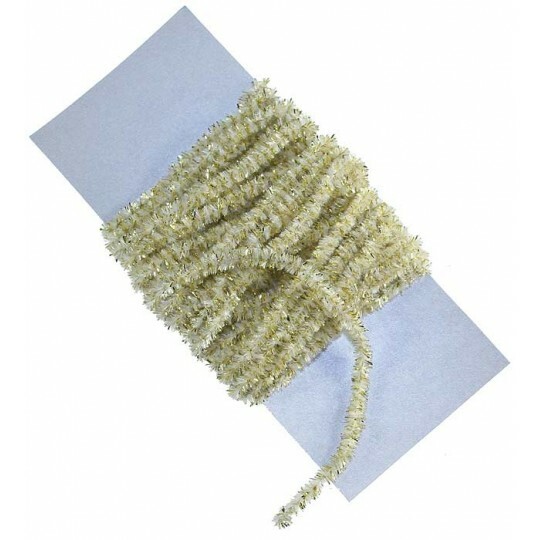 5 yards of ivory chenille and tinsel cording wound on a card. This soft and supple cording measures 3/16" wide overall. Made from ivory rayon and gold tinsel. Made especially for us in the USA. Priced at $4.95 per 5 yards. 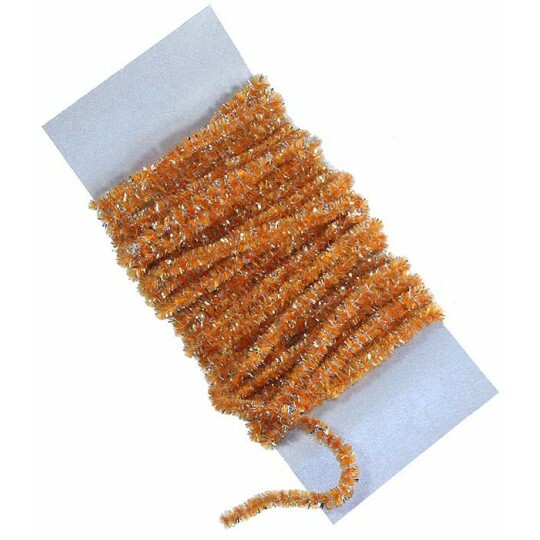 5 yards of pumpkin orange chenille and tinsel cording wound on a card. 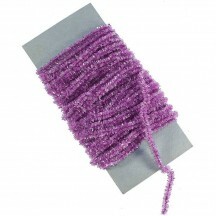 This soft and supple cording measures 3/16" wide overall. Made from rayon and tinsel. Made especially for us in the USA. Priced at $4.95 per 5 yards. 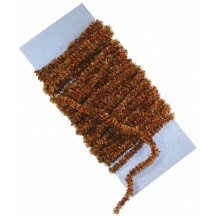 5 yards of tiger stripe chenille and tinsel cording wound on a card. This soft and supple cording in pumpkin orange, black and copper measures 3/16" wide overall. Made from rayon and tinsel. Made especially for us in the USA. Priced at $4.95 per 5 yards. 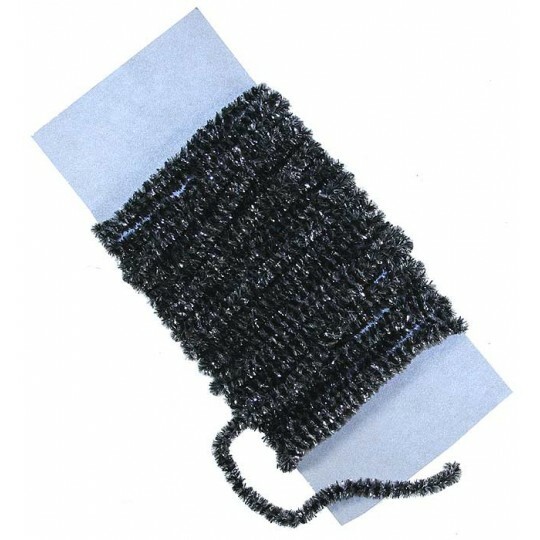 5 yards of black chenille and tinsel cording wound on a card. This soft and supple cording measures 3/16" wide overall. 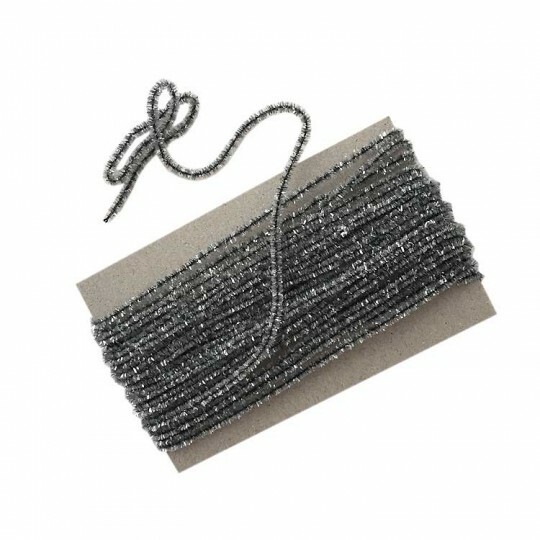 Made from black rayon and silver tinsel. Made especially for us in the USA. Priced at $4.95 per 5 yards.